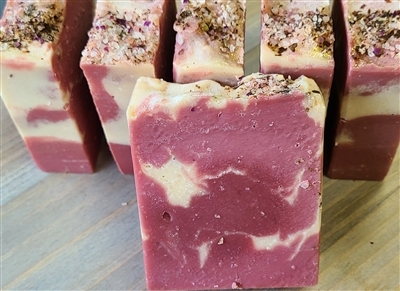 This cold process soap bar is created with almond milk instead of water for an amazing creamy lather. Sugary rose jam is blended with salty tears and sprinkled with pink himalyan sea salt and rose petals. Weighs approximately 4.5 ounces. Ingredients: Saponified Olive, Coconut, Palm Kernel, and Castor Oils, Almond Milk, Shea Oil, Sustainable Palm Oil, Mica, Titanium Dioxide, Iron Oxide, Tin Oxide, Fragrance Oils, Essential Oils, Pink Himalayan Sea Salt, Rose Petals. These soap bars are handmade and each bar will be unique and slightly different. Ingredients: Saponified Olive, Coconut, Palm Kernel, and Castor Oils, Almond Milk, Shea Oil, Sustainable Palm Oil, Mica, Titanium Dioxide, Iron Oxide, Tin Oxide, Fragrance Oils, Essential Oils, Pink Himalayan Sea Salt, Rose Petals.